In the wild, they feed on aquatic plants, algae, insects, molluscks and fish. Lakes, Ponds, large Rivers and drown Forests. Mississippi River from St. Croiz, Wisconsin and upper Mississippi River south through Louisiana and east Texas. These are aggressive baskers, so a basking spot is required. UVB lighting is needed as well as a heat lamp over the basking spot. A submersible heater is recommended if the water temps fall below the recommendation. They are excellent swimmers and their captive habitat should have a water depth as deep as possible. Substrate should be anywhere from a sand to a fine-to-medium size gravel. Recommended size for a single adult Graptemys ouchitensis ouchitensis would be a 40 gallon aquarium as a minimum (55 or larger preferred) for males, and a 90 gallon aquarium as a minimum (100 or larger preferred) for large females. This will provide adequate swimming area, as well as assisting the filtration in maintaining good water quality. For additional Graptemys ouchitensis ouchitensis, I would recommend adding 20 gallons of tank space for additional males and 50 gallons of tank space per additional female at a minimum. Stock Tanks and Rubbermaid containers also work well. The same space recommendations remain the same. In captivity, they do well on Mazuri and ReptoMin, Reptile/Pond 10, Cichlid Sticks, aquatic plants, fish, veggies, snails, crickets, assorted worms and insects. 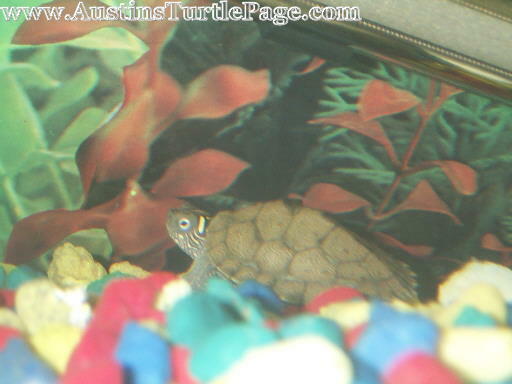 Ouachita Map Turtles are great turtles for a community habitat with Mud Turtles, Musk Turtles, Sliders, Cooters, other Map Turtles and Painted Turtles. They are one of the most skittish species of map turtles, but some individuals can be more tolerant of people. Map turtles in general are sensitive to water quality, so close attention to their water quality is needed.